Liam Fox sounds astonishingly uninformed. Britain's Secretary of State for Defense went on record yesterday calling for a retail ban on EA's forthcoming Medal of Honor, a modern military first-person shooter set during the 2001 invasion of Afghanistan. This, despite the fact that he's never played it. Ignorance never silenced a politician. Fox told The Sunday Times he was "disgusted" with the game, and that it was "shocking that someone would think it acceptable to recreate the acts of the Taliban against British soldiers." 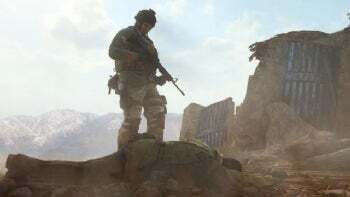 The game, like most faction-based shooters, allows you to play as either of two opposing sides--a group of invading U.S. Army Rangers, or the defending Taliban forces. "At the hands of the Taliban, children have lost fathers and wives have lost husbands," opined Fox, adding that "It's hard to believe any citizen of our country would wish to buy such a thoroughly un-British game," and urging retailers "to show their support for our armed forces and ban this tasteless product." EA's response to Fox's comments was unequivocal. The company said Fox was inaccurately describing the game, that the game "does not allow players to kill British soldiers," and that "no British troops feature in the game." Fox was undeterred. A spokeperson today said Fox "stood by" his comments, arguing that "the point remains that part of this game allows you to play the part of the Taliban attacking ISAF [International Security Assistance Force] troops in the area of central Helmand where British troops are operating." Picking up a broader brush to paint with? It's certainly one way to avoid the implications of an error, the rationale behind the original point notwithstanding. MCV reports that the Department for Culture Media and Sport (DCMS) has "distanced itself" from Fox's comments. "Dr Fox was expressing a personal view and we understand why some people might find the subject matter of the game offensive," said a DCMS spokesperson. "There is a ratings system in place which exists to categorize games appropriately, in this case the game in question is rated 18 so should only be sold to, and played by, adults." Kudos to the DCMS for getting it right. Boo-hiss Liam Fox--the same Liam Fox previously accused of racism for referring to Afghanistan as a "broken 13th-century country"--for ignorantly calling for a ban on a game he's neither seen nor played.